Recent news, analysis, and commentary about special operations, national defense, and conflicts around the world. More on SAS Soldier and Keyan Hotel. A former member of the Special Air Service comments on the siege at the hotel in Nairobi. (Forces Network, Jan 17, 2019). One American died in the attack. Even More on SAS Soldier. And even more details are available. The SAS operator was a member of the British Territorial Army SAS – the reserve component of the UK SOF unit. The 22 SAS Regiment is the active duty unit; while the 21 SAS and 23 SAS Regiments are territorial (reserve) units. The members of 21 and 23 SAS frequently augment 22 SAS on long tours to conflict areas. Traditionally, 21 and 23 SAS conduct SR / FID missions; however, lately they are also doing SR / HERA operations. Read “The True Story Behind the SAS Operator in Kenya”, Spec Ops Magazine, January 19, 2019. Kenyan Recce Unit. While the lone SAS operator is getting a lot of press; somewhat ignored is the role of the Kenyan Recce Unit who worked the rescue as well. See “Recce Unit: The Making of a Special Force”, Standard Media (KE), January 18, 2019. Course Taught by Panama’s National Border Service. Read up about a 4-week long course taught by an elite unit of the Panamanian military. (Dialog Americas, Jan 17, 2019). India’s Revamped SOF. There is a new elite organization being formed that is will provide an enhanced special operations capability to India’s military. It will come online in November 2019. Read “India to raise its own SEALs”, The Pioneer, January 18, 2019. See also an article by Defence Aviation Post (Jan 19, 2019). SEALs and ‘The Big War’. The U.S. Navy SEALs have been busy with conducting counter-terrorism (CT) and counterinsurgency (COIN) missions in Iraq, Afghanistan, Somalia, and other parts of the world. But now they are re-focusing their efforts and training for ‘The Big War’. Read “After Years Fighting Terrorism, the SEALs Turn Their Eyes Toward Fighting Big Wars”, Defense News, January 17, 2019. Life of an SF Medic. Read “Breathe: What It’s Like to Be a Special Forces Medic”, The Havok Journal, January 17, 2019. Story of GB in Vietnam. A Vietnam Vet who served in Special Forces provides a summary of his service and the long recovery from wounds in this article. Read “Green Beret’s Vietnam service was nothing like the movies”, The Plainer Dealer, January 20, 2019. Intel and SOF Museum. An article by the president of the OSS Society, Charles Pinck, provides the background to the establishment of the future National Museum of Intelligence and Special Operations. (Richmond Times-Dispatch, Jan 18, 2019). New Scope for SOF. The Pentagon has selected Sig Sauer to supply special operations units with a new rifle scope. (Military.com, Jan 17, 2019). SEALs, PTSD, and Electric Therapy. Read how electric therapy is curing Navy SEALs of PTSD. (Defense One, Jan 20, 2019). Missing 7th SFGA Soldier. Read a press release by the 7th Special Forces Group on one of its Soldiers. “Media Advisory: SGT Greco A. Tucker”, 7th SFGA DVIDS, January 16, 2019. 19th SFGA Chaplain Dies. CPT Corey Holmgren, the chaplain for the 19th Special Forces Group, died while swimming laps at a pool in West Jordan. He was on orders at the time of his death. He was present for the return of members of the 19th SFGA who returned from an overseas deployment. (Stars and Stripes, Jan 20, 2019). USSOCOM and Ethics. BG (Ret) Craig Nixon is interviewed on U.S. special operations forces. He provides insight into the current ethics problems, mission creep, and the effect of constant deployments for its operators. Read “SOCOM’s Discipline and Ethics on the Radar”, The Cipher Brief, January 18, 2019. Hearing for GB Accused of Murder. A preliminary hearing has been set for March 14, 2019 at Fort Bragg for Major Matthew Golsteyn. Read “Hearing set for former Green Beret accused of murdering alleged Afghan bomb-maker”, Army Times, January 17, 2019. Retired JAG Weighs in on Golsteyn Case. A retired Marine Corps JAG officer believes there is some media distortion taking place in the case of Green Beret Major Golsteyn. (Connecting Vets, Jan 18, 2019). MARSOC Operator Charged. A special operations Marine was recently arrested and charged with assault inflicting serious injury during an incident in 2018. He is accused of beating up his girlfriend. (Task and Purpose, Jan 18, 2019). SEAL Comments on ‘Toxic Masculinity’. A former Navy SEAL, Jocko Willink, takes issue with a Gillette commercial that that attempts to marginalize boys and men. He argues that “traditional masculinity – with its traits of stoicism, competitiveness, dominance, and aggression – has a place in a man’s life; but that these traits need to be managed and balanced. Read “Ex-Navy SEAL Jocko Willink: ‘Toxic masculinity’ and the powerful dichotomy of being a man”, Fox News, January 19, 2019. But . . . Who Will Feed the Lions? If you think that the ‘Alpha Male’ is an anachronism and want to be a new ‘modern man’ then there is some advice out there for you. After all, someone has to run at the back of the pack to feed the lions. Read “Obsolete Man Skills You Should Ditch”, Askmen.com, January 11, 2019. “By, With, Through”. Morgan Kaplan, of the Buffett Institute at Northwestern, presents several probing questions about U.S. efforts to work with partners and concludes that this approach should not be uncritically embraced. Read “Thinking Critically About ‘By, With, Through’ in Syria, Iraq, and Beyond”, Lawfare Blog, January 20, 2019. SF Officer Predicts Future. Doug Livermore, a Special Forces officer, provides his perspective on what the future will bring for U.S. defense in “Military Trends and Predictions: 2020”, Defence IQ, January 18, 2019. Burn Pits. The Supreme Court refused to hear an appeal by veterans of the Afghan and Iraq wars who say that toxic smoke from burn pits made them ill. See “Veterans Claiming Illness From Burn Pits Lose Court Fight”, NPR, January 16, 2019. LAA? Not on the Horizon. The Air Force is in the ‘go slow’ mode on the acquisition of a Light Attack Aircraft capability. The capability of fielding propeller-driven aircraft for ‘affordable’ close air support in a COIN environment is not in the immediate future. Some advocate the use of an aircraft like the A-29 Super Tucano for low intensity warfare conflicts but the U.S. Air Force is hesitant. Read “No Light Attack Planes Any Time Soon: Air Force Undersecretary”, Breaking Defense, January 18, 2019. ‘Argo’ Spy Dies. A real life spy portrayed by Ben Affleck in a 2012 movie (watch the trailer) about the rescue of six American diplomats has passed away. The Americans were hidden in the Canadian embassy during the seizure of the U.S. embassy in Tehran in 1980. Tony Mendez, a CIA officer, conducted a daring rescue in what is now called the “Canadian Caper”. He excelled in the art of ‘exfiltration’ – getting people out of dangerous situations in foreign countries. Tony wrote a memoir entitled The Master of Disguise. Read more in “Tony Mendez, The ‘Argo’ Spy Who Rescued Americans in Iran, Dies at 78”, National Public Radio, January 19, 2019. Females and British Cyber Security. The GCHQ intelligence service is running all-women classes in a bid to diversify its cyber-skills workforce. (Independent, Jan 19, 2019). U.S. Army in Iraq War. The United States Army War College has published two studies about the U.S. Army in the Iraq War. The two volumes cover the period from 2003 to 2011. Posted online on January 17, 2019. Trump Backs NATO. The love-hate relationship that President Trump has with the North Atlantic Treaty Organization is confusing and has been the topic of many news stories over the past two years. In a recent public appearance he said he backs NATO 100%. (Defense News, Jan 17, 2019). But Does He “Really Back” NATO? Admiral Stavridis (Ret), a former Supreme Allied Commander at NATO, says that the Russia president is most likely very delighted that European confidence in Trump’s commitment to NATO is shattered. (Time.com, Jan 18, 2019). Car Bomb in Colombia. Approximately 21 people were killed when a car bomb exploded on Thursday, January 17, 2019 at a Colombian Police Academy in Bogota. The morning attack also injured at least 68 people. No group has claimed responsibility. Pipeline bombings have also been taking place in Colombia – perpetrated by the ELN. The National Liberation Army or ELN has grown in strength since the demobilization of the FARC. Read up on the ELN in “Colombia’s lesser known rebel group still delivers violence and wreaks havoc”, Los Angeles Times, January 17, 2019. NK as Nuclear State? A recent video by U.S. Forces Japan recognized North Korea as a nuclear state with 15 nuclear weapons. Since its posting online it has been removed for editing. (Stars and Stripes, Jan 17, 2019). Syria – U.S. Vital Interests at Stake. Brian Padden argues that leaving Syria has some serious ramifications. He states that some critics argue leaving Syria will “. . . undermine key U.S. strategic objectives: to prevent the threat of terrorism at home, to deter Iran’s growing military influence and power, and to defend U.S. ally Israel.” Read “US Syria Withdrawal Risks Vital Strategic Interests”, Voice of America, January 18, 2019. Paper on ME by SSG. Brad Patty of the Security Studies Group has penned a paper providing a new path in the U.S. foreign policy in the Middle East. It assesses U.S. national interests and advocates a ‘carrot and stick’ approach to rewarding our ‘friends’ and ‘punishing’ our enemies. Read A New Way Forward in the Middle East: Nine Strategems. (Jan 14, 2019). COP Conrad – Somalia. In June 2018 SSG Alexander Conrad, a member of the 3rd Special Forces Group, was killed in in Somalia. A small Somali government outpost has been named in his honor. Read the story of the mission to establish this outpost and difficult fight to keep in in government hands. See “America’s Other Endless War: Battling al-Shabaab in Somalia”, The Wall Street Journal, January 17, 2019. U.S. Airstrike Kills al-Shabaab Fighters. U.S. officials say that 52 al-Shabaab militants have been killed in a retaliatory airstrike in Somalia on Saturday, January 19th. The armed group had recently attack a Somali military base killing scores of Somali government soldiers. See “Scores of Somali Militants Killed in Fighting, Airstrike”, Voice of America, January 19, 2019. Ethiopia to Resume Offensive. Spokesmen for the Ethiopian armed forces have said that its military will likely begin another round of offensive operations against al-Shabaab in Somalia. (AP, Jan 19, 2019). Paper – North Africa Maghreb. One Middle East / North Africa expert predicts a turbulent future for North Africa. He believes that elections, public protests, and economic trends will create the potential for crises that will undermine stability and regional security. Read “Turbulence Ahead: The North African Maghreb in 2019”, Center for Strategic & International Studies, January 11, 2019. Podcast: The First Special Forces Soldiers Into Afghanistan. Jason Amerine and Mark Nutsch talk about their time in command of Special Forces A-teams that were inserted into Afghanistan in the fall of 2001. (Modern War Institute at West Point, 1 hour). Worried about Losing Your Masculinity? Join the Dollar Shave Club. MC-130J Crew Conducts Low Level Flight, 1st Combat Camera Squadron, January 16, 2019. A MC130J Commando II aircrew from Canon AFB conducts low level flying operations. ( 1 min). Apaches and SOF JTACs Trainup. Joint Terminal Attack Controllers from the 148th Air Force Special Operations Command (ASOS) train up with AH-64 crews during Southern Strike 19. (172nd Airlift Wing, 1 min, Jan 18, 2019). 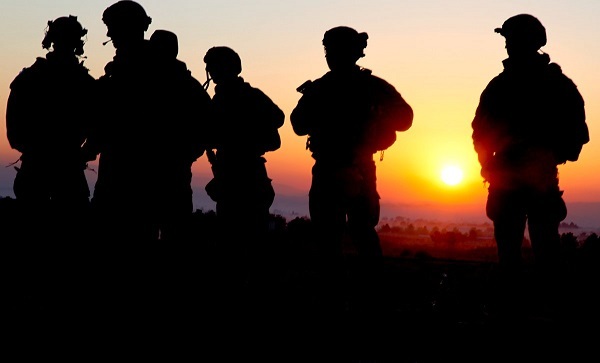 Photo: Soldiers at Sunset. Department of Defense photo.